If you are a Trekkie or know one, then surely the $12.99 Star Trek Enterprise & Shuttle Salt & Pepper Shakers is the perfect gift idea. After all, you know that traveling across galaxies is virtually impossible at the moment with the kind of technology that we have, but what you can do is this – bring your taste buds to where no man has gone before, as long as you have good quality Himalayan salt inside as well as pepper from the freshest pepper seeds. It is also said that the farthest distance is between the head and the heart, and as everyone knows, the way to a man’s heart is through his stomach – so once you’ve got that secret family recipe down pat with the right amount of salt and pepper, surely you will be able to win your potential beau’s heart, no? 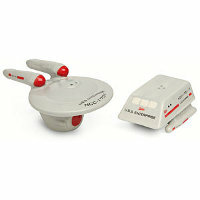 The set comprises of the Enterprise NCC-1701 and the Shuttle, where they are made out of glazed ceramic while sporting a magnet insert which ensures they remain docked together when no one else requests for them. Just remember to hand wash them and you’re good to go.